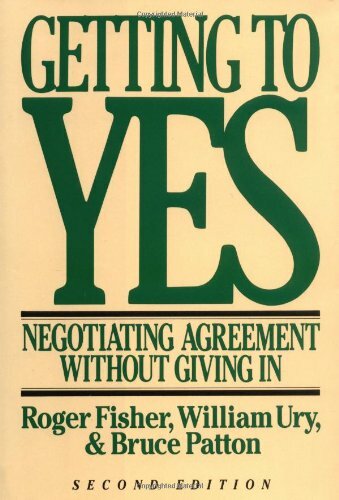 Getting To Yes Summary provides a free book summary, key takeaways, review, top quotes, author biography and other vital points of Roger Fisher, William Ury and Bruce M. Patton’s book. 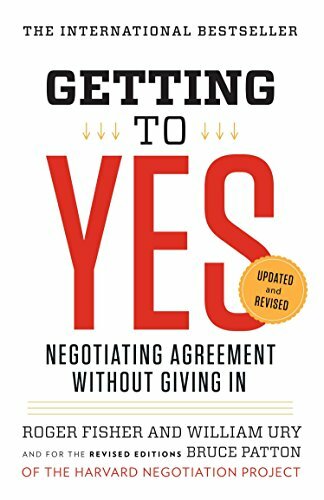 This book Getting To Yes explains the key to effective negotiation. It’s a step-by-step guide. The book uses personal examples. These examples show both negative and positive negotiation strategies. Reaching an amicable agreement with proper negotiation is possible. Principled negotiation involves respect for each other’s interests. The parties then jointly create options which are mutually beneficial. This results in an appropriate settlement. It’s the second edition. Hence, authors answer ten questions of readers from the first edition. Q&A part will be helpful if you get any doubts while reading. The text is simple to read and understand. Also, you can instantly use the techniques. Can we ask for more? Probably no. When to and when not to have a mediator. Is relationship the primary concern in negotiation? Then you are at risk of reaching a bad agreement. People and problem are separate in a wise negotiation. Don’t focus on positions; instead on interests”. Produce a range of options before making a decision. Insist that impartial standards be used for results. Identify your BATNA – the Best Alternative to a Negotiated Agreement. Quality of your BATNA determines your power in a negotiation. Political ties, wealth or physical strength do not define your potential. Don’t use statements; instead, use questions. Silence can be your weapon. Ask something. Then pause. Even when you aren’t talking, you’re doing some great negotiation. When nothing else works, use a third-party mediator. Negotiation involves giving up and taking on positions. The two parties negotiate over positions. They lock themselves in their perspectives. Such a process needs many different decisions. It makes the bargain difficult. Strategies like threats or stonewalling are common. Positional bargain raises the cost and time to agree. There’s also a risk that no agreement is reached at. The fight of egos damage relationships. Bitter feelings last for a lifetime. Many know the risk of understanding positional bargain. Hence, they use a softer approach. They treat the opposite party as a friend. Plus, they show agreement as their goal, not a victory. It’s common to make offers and discounts to be friendly. An is also done to prevent an argument. Most negotiation among family and friends happens this way. The resulting agreements are quick. But, they may not be wise. The relationship shouldn’t be the primary concern in a negotiation. If it is, then the agreement is shabby. People pursuing soft positional bargain are weak in front of a hard negotiator. People – Don’t attack people, but the problem. People mix their egos with the positions. They don’t communicate in a clear way. Interests – Don’t focus on positions, but on interests. Try to satisfy the main interests because of which parties took their positions. Options – Creating the right solutions under pressure is tough. Making decisions in front of the opponent narrows the vision. You may limit your creativity if you’ve too much at stake. To beat these problems, set a time to generate possible options. These solutions should promote joint interests and settle the differences. Criteria – Some negotiators are stubborn. This way they get what they want. Handle such a negotiator by claiming that one voice isn’t enough. Ask for a fair criterion for the agreement. This criterion must be independent of both sides’ desires. Use unbiased standards to base the terms. These can include market value, law or expert opinion. Both parties can work to arrive at a fair deal. No single party needs to give in. You can save yourself from a bad result by setting a bottom line. This is the worst acceptable result to help you fight the pressures. But, such protection has a high cost. You may be firm that anything the other party says can’t change your bottom line. But, this way you’re limiting your ability to use things you learn while negotiating. A bottom line tends to be very rigid. It limits creativity, and you’re unable to devise a rational solution. A bottom-line may save you from the crucial agreement. But, it will also ruin your chances to create a solution. An alternative to the bottom line is determining your BATNA. BATNA stands for Best Alternative to a Negotiated Agreement. Analyse a proposed agreement against BATNA. It will save you from agreeing to a bad proposal. Plus, it’ll prevent you from declining an agreement of your interest. A BATNA isn’t rigid. It’ll allow you to seek a creative solution. Compare your BATNA with your proposal. Check which meets your interests better. If you don’t think about BATNA, you’re bargaining with closed eyes. You might be very optimistic. It’s possible that you might have other choices. But even if you have an alternative, think carefully. Because then, you’ll not appreciate the results of using that option. Overcommitment to agreeing is a significant risk. Keep a temporary answer to, “what if the negotiation doesn’t work?” This is very important for a wise negotiation. The quality of your BATNA determines your power to negotiate. Not your wealth or political connections. Wealth can also weaken the bargain position of a party wanting a lower price. How appealing it’s for both parties do not reach an agreement? The answer to this determines the negotiation power. Adopt these three operations to create your BATNAs. Firstly, list down the actions you may take in case there’s no agreement. Then, work on the ideas with the highest potential. Convert these ideas into practical options. Lastly, choose the best alternative. Your BATNA is here! A good BATNA makes it easier to improve the terms of a negotiated agreement. It gives you the confidence to stop a negotiation. When you’re willing to break a talk, then you can put your interests more forcefully. Consider the other party’s BATNA. It’ll better prepare you for the bargain. This way, you can predict what to expect in a negotiation. Suppose their BATNA is very good. And they will not need to bargain on merits. In this case, how can you change their BATNA? For example, a power plant is spreading pollution in a local area. Their BATNA is to neglect protests and keep on doing the business. In this case, you need to file for a ban to cease their operations. This will make their BATNA less appealing than earlier. When both parties’ BATNAs are attractive, it’s not possible to reach an agreement. What to do in this case? Amicably decide to look somewhere else instead of reaching the agreement. What if even the BATNA strategy fails? Then you may use an approach focusing on what the other party might do. You may counter the core moves of the positional bargain. This will redirect their focus to the case’s merits. It’s called the “negotiation jujitsu”. In the positional bargain, saving your position will lock you in. Plus, attacking the other side’s position will lock them in. Too much energy and time are spent on this cycle. So, what to do if pushing back isn’t working? It’s simple. Stop pushing back. Don’t defend when they attack. Break this cycle by not reacting. Like in jujitsu and judo also, you don’t put all your strength against the opponent. Rather step aside and use their strength against them. The attack on your stances. The forceful assertion of their position – When the other party puts their ideas, don’t attack them. Instead, see them as a possible solution. Consider ways to make it better. Find the interests below their position. See each position as an excellent try to handle the main concerns of both parties. Ask how that position deals with the issue. Review their position. Check the degree to which it satisfies interests of both sides. Also, see how to improve the position. For improving it, discuss what’ll happen if their terms are accepted. It’s important for them to know that for you it’s an unrealistic option. Hence, they may accept other alternatives. The attack on your ideas – If they attack your thoughts, don’t save them. Invite advice and criticism. Don’t force them to accept or reject your ideas. Instead, ask what’s wrong with them. By knowing their negative stances, you can know their core interests. This way you can make your ideas better from their stand. Turn criticism into a key ingredient for the process. Seek their advice. Place them in your shoes and ask what they’d do. This way they confront half of your problem. Maybe they can create a solution which satisfies your concerns. The personal attack – Try not to defend yourself even when they attack you personally. Be patient. Allow the other side to vent out. Listen. Show that you understand their feelings. When they’re done, use the personal attack as one on the issue. Remember two essential tools when using jujitsu approach. First, don’t use statements, instead use questions. Second, silence is a great weapon. Questions produce answers, but statements build resistance. When you ask questions, the other party can outline its points. Questions can enable the other party to face the problem. Rather than criticizing, queries educate. Silence creates the impression of a deadlock. If you ask something and get a vague answer, wait. When people doubt what they said, silence could be uncomfortable. The other party is likely to feel pressured to break the silence. Then they may answer in more detail or have a new suggestion. Ask queries and take a break. You can do some of the wisest negotiations by keeping mum. When everything else fails, call the third-party. Mediators separate the problem from the people more easily. They take the discussion to options and interests. Mediators offer an impartial basis to make decisions. Plus, they also decrease the number of decisions to agree. Instead, they’re only exploring the possibility to give a recommendation. They use this detail and make a list of needs and interests. Then they ask both sides to give their opinions on the list. Mediators use such criticism to improve things. Criticism is better than making compromises. They use this criticism to make a rough draft of the agreement. Mediators claim that the deal may have errors. But, they want both parties’ input before going ahead. They then use such input to make the second draft. This’s still not complete, but better than the initial one. The cycle goes on for a third, fourth and fifth plan. Mediators don’t stop until they think that no more improvement is possible. Now, they give the idea to both sides. Each side has just one decision to take: no or yes. The one-text process moves the game away from the positional bargain. It simplifies the process of building options and mutually deciding one. This process is very important for long multi-layered negotiations. 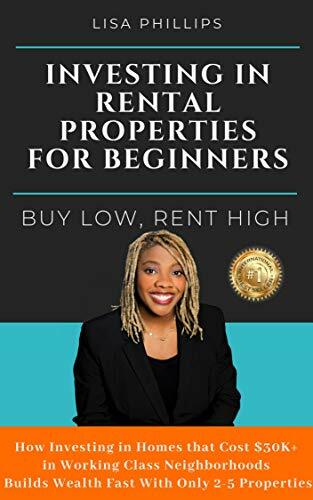 If someone is looking to learn the art of negotiations, and reaching an amicable settlement point, this book is going to be an excellent tool for them as it has all the crucial elements. A negotiator needs to have particular skills while going into any negotiations. The first critical thing is to keep relationships away from the essence of negotiations. It means that personal problems or people should never be the subjects of negotiations. A negotiator should not look at the position or relationship; instead, the focus should be given to interests and range of options. The book very well explains that negotiations are done, when two parties want to protect their interests. So, try to reach a point of settlement, where both parties are happy. 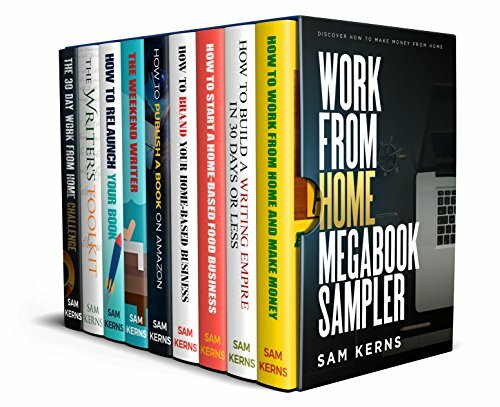 The book also describes various negative as well as positive negotiation strategies and details them with some examples so that readers can easily understand all of them. 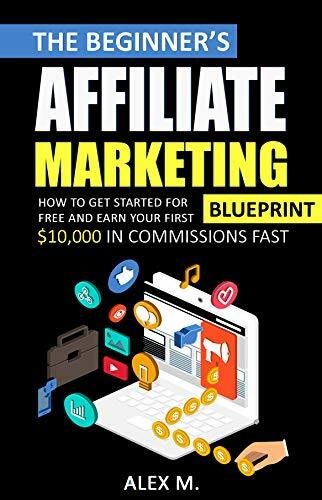 The good thing about the book is that it has used straightforward and understandable language for every reader, who wants to learn negotiation strategies. It has explained ideas with relevant, simple examples that every ordinary reader will be able to get the main theme. The book stressed that respect is a very crucial thing in negotiations. When negotiation is based on positive principles, then it has the element of respect that people show for each other’s interests. Successful negotiations are not the ones, which only look at one’s party own interests. So, it is necessary for negotiation parties to develop a mutual point of understanding, where they agree upon mutual benefits. The other significant part of this book edition is that it has included a Q&A section, which has answered questions from the readers. So, if anyone has the same doubts & questions in mind, the Q&A section will clear those doubts, and help a person to become an effective negotiator. Roger Fisher is a professor at the Harvard Law School teaching negotiation. He’s also the director of the Harvard Negotiation Project. Fisher was the executive editor and originator of the acclaimed TV series, The Advocates. William L. Ury authored Getting Past No: Negotiating Your Way from Confrontation to Cooperation. Bruce M. Patton co-authored Difficult Conversations: How to Discuss What Matters Most. What is your thought on Getting To Yes Summary? Please feel free to leave us your comment. Yes, I agree with you in the negotiation two parties communicate and decide the matter that best suits to both parties. In the families, we negotiate in a friendly manner that sometimes cannot be the wise negotiation. Hard negotiators create difficulty for the soft positional bargain in the negotiation process to win arguments. Therefore dominating and hard negotiators mostly decide the matter that goes in the favor of them by winning the negotiation. You are right, people should focus on the interests rather than positions. Through satisfying the interest of the people they can win negotiation as people most of the time concerns with their needs and satisfaction of interests therefore when a person satisfy their interest even through the different option or way (from what they were presenting) they will accept. This is a wonderful site of book summaries. It is free of charge with high-quality summaries. Good job. Thanks a lot. Have you read Think and Grow Rich Summary? This is wonderful. Hеllo! Thanks for your post. It helps me understand more about the art of getting yes. Please kepp up your good work. Hi Scottqueet, thanks for your comment. Hope you enjoy. Meanwhile, have you read another Summary of The Effective Executive? You will love it too! Thanks for your great work on summarising this book.